Ekaterina Videman is the spokesman for Mechel and Mechel Mining, wealth accumulation vehicles controlled by Igor Zyuzin (left). What she and the company announce publicly is what they want public shareholders to think, and they do not respond readily to questions. This is allowable under the New York Stock Exchange rules for Mechel, because it is a foreign-domiciled listing on the US exchange, and that exempts it from disclosure requirements which apply to the domestic stocks on the same exchange. Take the question of whether Mechel, its steel mills and coal mines are performing better or worse. That is usually an acid test for public shareholding companies – the basis on which it is valued and its shares fairly priced in the market place. The good news is easy to publish. But how do Zyuzin and Videman handle the not so good news? Hiding it is one method; disguising it another. According to this week’s production and trading report from Mechel for the nine months to September 30, the bad news is that production is falling. 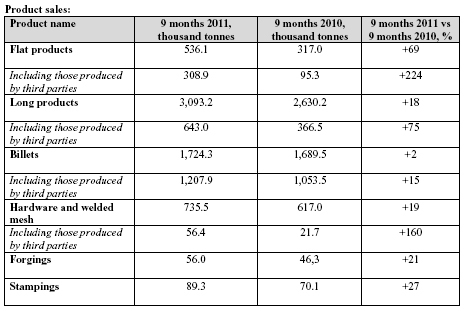 The company release shows that crude steel output came to 4.5 million tonnes, virtually unchanged compared to the same period of 2010. Pig-iron production was down 13% to 2.7 million tonnes; and coal output was down 4% to 19.8 million tonnes. But at the same time, sales of every category of steel products were jumping upwards. The asterisk says: “Starting with this period, figures on product sales of Mechel OAO’s mining division include sales made within the Group.” What isn’t clear is what plants are included in “the Group”. No quarter-on-quarter data have been released, however; and sales of steel from mills formerly owned by the Estar group of Vadim Varshavsky have been counted although they are not owned by Mechel. Sales of steel are reported for Mechel units, as well as by “third parties”, which the company does not identify in its report. These appear to include steel mills taken over for management from the bankrupt Estar group; these include Nytva, Zlatoust, Rostov, and Gurievsk in Russia, and Donetsk Electrometallurgical in Ukraine. How these assets have fallen out of Varshavsky’s hands and into Zyuzin’s has been documented, not in Mechel disclosures to the US Securities and Exchange Commission (SEC), but here. Counting only the Mechel goods, and comparing like with like, flat steel sales came to 22,200 tonnes, almost unchanged from a year ago. 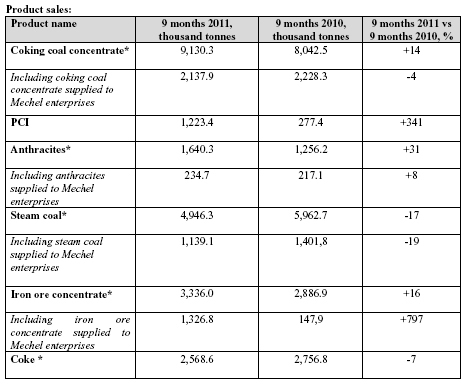 Long product sales totaled 2.45 million tonnes, up 8% year on year. Billet sales were 516,000 tonnes, down 19%. Mechel is the virtual monopolist of nickel-alloyed stainless steel production in Russia, but it does not release production or sales results for this type of product. Spokesman Videman refuses to say why. Since other Russian steelmakers are reporting that from the second to the third quarters, steel production and sales were weakening, not reporting the quarterly comparisons may be Mechel’s method for camouflaging the negative trend. 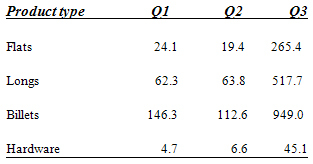 Mechel was asked why it is not releasing these quarterly data. Videman replies: “In 2009 the company did disclose quarter to quarter changes in order to better describe recovery of capacity utilization during the crisis time. Now, as you can see, we have moved to a new disclosure format, and we show not only production but also sales, since it is more convenient to assess the financial condition of the company by this indicator. Since the beginning of this year we have been showing a comparison of the current period to the same period last year.” Note the term “convenient” – no prize for guessing whose convenience is intended. So has Mechel tried to disguise a worsening sales and profit picture in the third quarter by adding in raw material sales to the Estar plants, and sales of the Estar steel products, without saying so? Who are the “third parties” referred to in the latest report, Videman was asked: “Among the third parties are the mills of Estar, Mechel’s strategic partner”, she replied. But here’s another puzzle — either there has been spectacular growth on the part of the Estar plants, or there have been counting changes. Videman was asked to explain. She confirmed the accuracy of the numbers in this table, but not the reason for them. Because the international market has judged that most of Mechel’s share value is in its coal-mining prospects, it is to be expected that as its coal picture darkens, the Mechel share price will go down. Mechel’s share price was already down 57% in the year to date, before the latest report. In the day since it was issued, the share price has fallen another 6%. From coalmining to goldming. Dmitry Yakushkin is the spokesman for Highland Gold, which has been owned by Roman Abramovich and his partners and through Barrick Gold, the Canadian goldminer, by its chairman Peter Munk. Abramovich and Munk have been business pals ever since 2003, when Munk quietly agreed to give Abramovich a lot of money for the goldminer, keeping the deal secret from his senior executives. 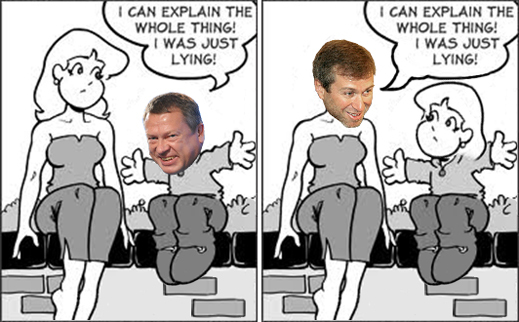 After they found out, they were flabbergasted by the misjudgement, and also by the excessive price Munk gave Abramovich. Munk’s subordinates took months to undo the boss’s mistakes. Other shenanigans followed. These days Abramovich’s holding is represented on the Highland Gold board by Eugene Shvidler and Eugene Tenenbaum. The company describes its stakeholders as Primerod International ltd, with 32%; Barrick Gold with 20.4%; and management with 8%. The free float is just over 39%. Through Primerod, Shvidler may be the direct owner of a stake, while Abramovich has claimed that he owns 25% of Primerod. Tenenbaum, a Canadian accountant for KPMG whose fortunes took off when he went to work for Abramovich, represents the Abramovich interest in Highland Gold. Just how bad was the weather in the second quarter? Yakushkin was asked; and if it wasn’t, how to explain the new production forecast, compared with the second and third-quarter targets promised by the company. Why release the bad news now, in November?